It would be silly, of course, to try and recount here the entire life story of Jamie Farr, currently reigning favorite son of Toledo (sorry, Katie Holmes, because I know I’m going to hear from you about this), because it is well-known already. He does a great job of it on his own website, jamiefarr.com, which has tons of personal recollections, great pictures, and is just plain fun to look at as well. But I was always interested in how it started out from a hometown-boy-makes-good standpoint. 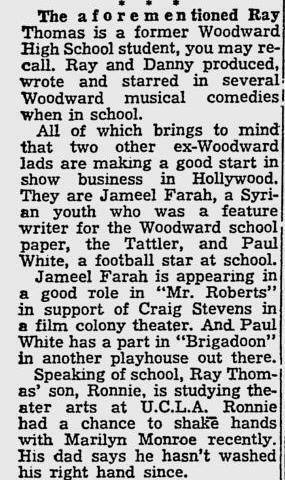 Farr was born Jameel Farah at the old Mercy Hospital on Jul 1, 1934, and when Farah hit Woodward High School, that’s when the show business bug began for him. It’s noted in the obituary of Rosemary Godfrey, who died in 2003. She was a social worker at The Friendly Center on N. Superior St., a community outreach center operated by the United Methodist Church, and recalled Jameel banging on the doors after school, demanding admittance in order to practice on the center’s piano. Other notations start early in the pages of The Blade and don’t let up. 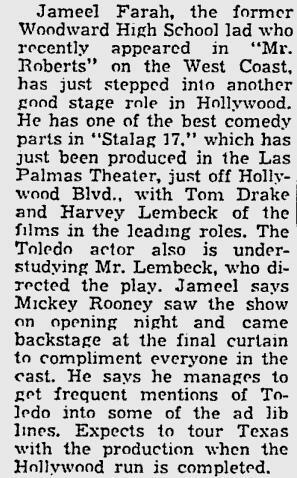 Woodbury, always adept at covering the show business activities of former Toledoans, mentioned Farah’s screen debut in MGM’s Blackboard Jungle on April 5, 1955 and that it would be playing at the Valentine. Woodbury sat down with then-Army Private Jameel Farah in an interview printed Sept. 5, 1957 during his first visit to Toledo in 5-1/2 years. He’d been busy, having been in three pictures and a number of television programs, and was probably best known at this point as Red Skelton’s sailor buddy Snorkel. He visited relatives, visited Woodward, and of course, made jokes about his nose. 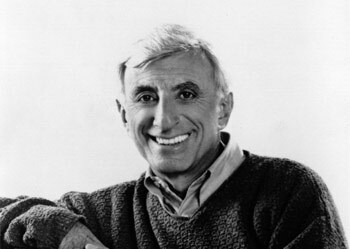 According to Farr in this 2000 interview, he changed his name to Jamie Farr after his two-year stint in the army. At the height of his Cpl. Maxwell Klinger popularity, Farr spent a busy four days here in 1977 on the occasion of his 25th Woodward High School reunion (he was the class president his senior year, 1952) . The city greeted him with “Jamie Farr Day and a Half,” where he planted trees at International Park, led a floatilla across the Maumee to Promenade Park, where he viewed a style show “featuring many of Toledo’s civic and commnity leaders modeling feminine fashions in the Klinger vogue.” Did that mean men in drag? Yes. Later, he donated his M*A*S*H scrips from the series’ first five years to the University of Toledo. While Farr ended his involvement as tournament host with the women’s golf tournament that bore his name for 28 years, he leaves a legacy of civic involvement with his hometown. The tournament raised $6.5 million that was funneled into more than 115 Northwest Ohio children’s charities since its inception in 1984. I was doing some geneology research on my Uncle Fred Shama who’s sister married a Faroh. It appears that the name was changed to Farah and moved to the Toledo area. I’m wondering if Jameel Farah is some how related to the people who spell their name Faroh? Any info whould be appreciated.